I had my reception in a barn, so it goes without saying that I love barn weddings! But I’m obsessed with the way the couples below transformed their barn venues to contrast a mix of classy and rustic. Silver-plated antique candelabras paired with lovely farm tables and crystal chandeliers hung from old barn beams—-yum! I especially love the way the couple used fringed shawls as table toppers below, what a unique idea. I LOVE those mirrors in the photo above. We have been collecting mirrors here at Something Vintage, dying to do something like this. Any takers? Here in DC, we are scrambling trying to ready our 1916 rowhouse for the impending Frankenstorm and to prepare for days without power. At Home Depot, all the candles and flashlights were sold out, so I decided to improvise and create a DIY oil lamp from a mason jar and a few household supplies. After all, I have 100s of Mason jars, so why not?! So far, so good—the lamp has been burning for a couple of hours and counting. 2. Cut a strip of your improvised wick (jute, string, etc) that is at least as tall as the mason jar. 3. Pour your oil into the jar. 4. Soak improvised wick in the oil—an hour is optimal. I didn’t soak mine for more than a minute and it still worked. 3. Insert the jute or improved wick through the hole in the top of the mason jar lid, leaving 1/4 inch or less sticking out above the jar lid. 5. Light the wick and taaaadaa! 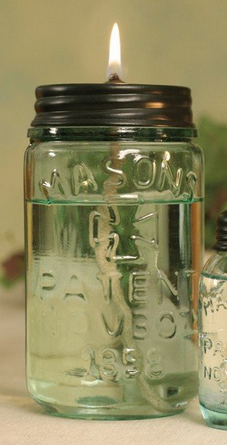 Your very own mason jar oil lamp. You will have to pull the wick up as it burns down. You can use pliers or tweezers to do this. 1/4 inch wick should last you quite some time, though. It goes without saying that you should not keep the mason jar lamp burning while you are not watching it. A couple weekends ago we had the pleasure of providing the vintage china and vintage silver-plated flatware to Laura and Brad for their wedding at the Inn at Mount Vernon barn in Sperryville, VA. 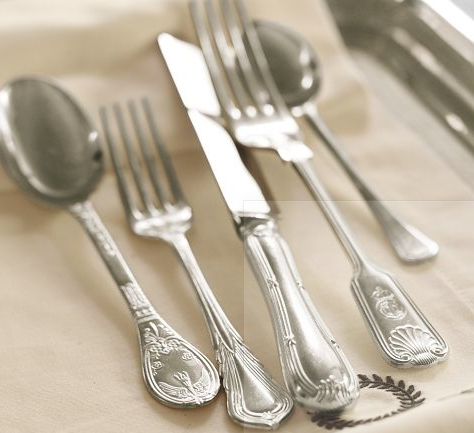 While we were styling the place settings, we realized how surprisingly amazing mismatching the antique silverware looked. I have to admit, I was definitely on the side of keeping all the silverware matching, but after accidentally mixing one setting, I was totally sold! 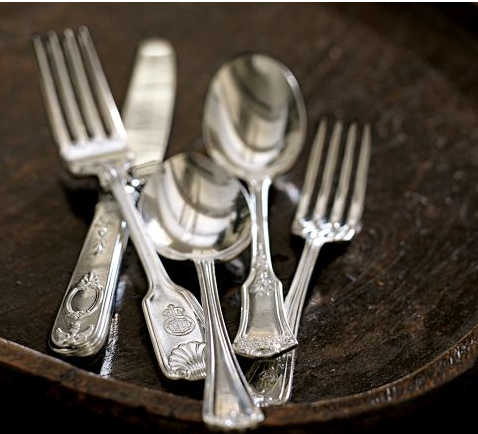 The look is so much more interesting and actually highlights the intricate patterns of the antique forks, knives, and spoons. Trust me, after polishing 100+ sets by hand, I was happy to let those patterns shine! 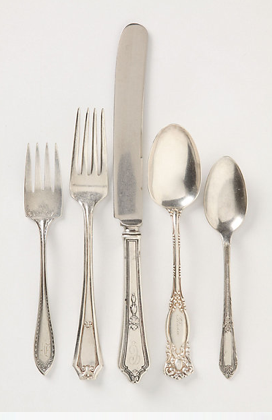 Turns out that Anthropologie and Pottery Barn offer mismatched vintage silverware sets to buy–for quite a high price, might I add! Lace – we can’t get enough of it!